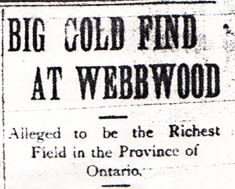 This was the headline in the Sault Star Thursday May 14, 1903. According to the article one or two "wise ones" had been quietly purchasing and securing options on property near the town.
. . ."From all reports the Webbwood find top anything ever heard of in Ontario. Already it is causing great excitement, and prospectors from many outside points are flocking into town". . . This article names Mr. Jas. Teare and associates with having secured a claim two and a half miles from Webbwood. It also names J.P. Miller and Judge O'Connor of the Sault as two of three owners of the "Golden Webb" property, which was located in the north part of lot 7. . ."not more than a stone's throw from the railway station." The article also states that Thomas Trotter owns three promising copper claims. The copper sulphite deposits were ledges 50 to 60 feet running northeast and southwest. The finding of these ore deposits prompted the Canada Copper Company to develop a power station at Birch Lake Falls in order to work their properties. February 1907 The Shakespeare gold mine at Webbwood was worked on an extensive scale. The directors of the company decided to have a 50 stamp mill installed. The company also constructed 12 dwelling houses fore the employees and a two and one-half storey boarding house. The mine was connected to the town of Webbwood by a telephone line. This company was controlled principally by men with the Diamond Match Company of the United States. N. McMillan, mine manager, who had lived in the Sault a short time, having previously had experience at the Mikado mine, Rainy River district. Mr. McMillan came from Scotland. His widow and children now at Webbwood. There is no blowing apparatus at the Shakespeare mine, so that dangerous gases from the explosives used might stay at the bottom of the 100 foot shaft for a very long time. Often in gold or silver mining a blast releases a quantity of carbonic gas a most deadly compound. This gas is so heavy that it can be raised from the bottom of a shaft in buckets, or an open umbrella. It has no colour, and the test made for it is to lower a lighted lantern into a shaft where it is suspected to exist. No light will burn in the gas. If it was carbonic gas which caused the trouble at Webbwood none of its victims could have suspected the truth. It is stated that Captain McMillan was the sixth man to go down and it was suggested to him to allow a rope to be tied round his body, but he declined. A seventh man was sent down with a rope around him with orders to keep on shouting "all right" till he got to the bottom. When the cries ceased, he was immediately hauled up. And report says it took 20 minutes to restore him to consciousness. The shaft of the mine is down about 100 feet and the men go up and down on a ladder. An inquest was held yesterday by Coroner Flaherty. Mr. J.J. Kehoe, crown attorney was present. Webbwood, August 5: A sad fatality occurred at the Shakespeare mine, about five miles north of the village, on Tuesday, Aug. 2 terminating in the deaths of N. McMillan, mine superintendent; P. Reid, engineer, and John Walters, Joseph Disley, P. Grant, Eli Latour, miners. This mine has undergone changes of late both as to the working operation as well as management, Mr. McMillan only having entered upon his duties on July 16 last. It appears day work only had been conducted for some time, and on the evening of each day a blast was made, and the following mornings were devoted to taking out the ore. And on the above date the miners as usual assembled for work a few minutes before 7 a.m., and Mr. McMillan not having yet arrived, it is supposed that Mr. Reid had issued an order to the four miners to descend to the drift leading from the 95' level, and they all went down the shaft at once in quick succession. Shortly after their disappearance down the mouth of the shaft, Mr. Bert Clinton, the only remaining workman at the mine, heard one of the men calling for air, and he immediately notified Mr. Reid, the engineer, to start the air compressor. But Reid, instead of starting a compressor, started down the shaft, and as the call for air continued Clinton ran to the boarding house and gave an alarm of "Trouble at the mine Mr. McMillan." Mr. Cronin, late superintendent, and Mr. Seely, V.P. of the company, hastened to the shaft, and Mr. Cronin turned on the steam and started the air compressor and dispatched Clinton to the Foley Mine for assistance. At this stage it appears the call from the mine for air had ceased, and Mr. McMillan started down the shaft, but Mr. Seely called him back. By this time the men from Foley Mine had arrived, and Mr. Andrew McGarry, one of them, started down the shaft, followed by McMillan. McMillan discovered the presence of strong gas and stepped on the shaft timbers close to the ladder for only a few seconds and then, it is supposed, became suffocated through inhaling the gas and fell to the bottom. McGarry then came to the surface, and a rope was put around Clinton who descended to investigate. He succeeded in getting to within a few feet of the victims below, when inturn became affected and was hauled to the surface in an unconscious condition. At this stage it became evident that gas was the cause of the whole trouble and as it would be only, adding more victims to its deadly effect to try further until the shift was thoroughly cleared of gas. To this end the compressor was working to its fullest capacity and by noon the bodies of the six unfortunate were brought to the surface. The verdict in the Shakespeare gold mine tragedy was to the effect that the men came to their deaths through suffocation, and the company was blamed for not having provided an air compressor able to do the work of clearing the mine of gases.